The paintings are coming along faster than I expected; I'll have them finished by the end of March. Currently my studio is wearing a bunch of the completed portraits on the walls, and it's great to see how it will all come together (thankfully, as planned!). PR: I'm looking into getting sponsorship for the clothing we'll wear, and bringing the show to galleries in Vancouver, Victoria, and possibly the Netherlands. I'll be able to bring the performance to Vancouver, and possibly in a slightly different form to Victoria, but I'm also going to film the show, so that it can be shown in combination with the exhibition, when it goes abroad. If you have any suggestions for venues, do email me at moontree (at) telus (dot) net. *UPDATE: With encouragement from some artist-friends in various countries, I'm now also looking into France, Switzerland, Germany and Los Angeles. This is about inspiring and connecting mothers, and mothers live everywhere. So I'd like to get the show out there. These videos are some of the rehearsal footage from last month. Without most of the participants (dancer, musicians, singers, etc.) we played and experimented with the shadows and accompaniment. Fun! **NOTE: Yes there WILL be front-lighting! This is just experimentation! The show is fast approaching -- suddenly the calendar says 2010 and it means I need to get myself moving! I've only completed four of the portraits, but the plans and performance are shaping up all around. I've invited a bunch of wonderful mothers and artists to perform with me at the show, and the meetings we've been having are totally inspirational. We sit in my living room, making shadow plays, figuring out harmonies, dance, paint techniques and lighting, talking about what to wear, and just generally letting our creative selves loose. We range in age from 34 to 60, and the energy is rich and diverse. It's beautiful! 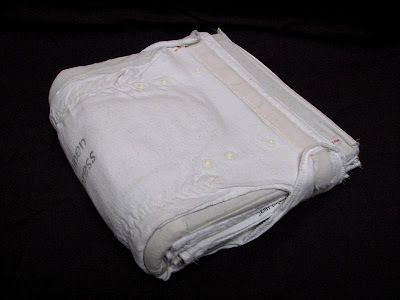 I'm looking for sponsors, right now, and, as always, am still looking for used (soiled is great too) white bed linens. Linen Press was exhibited at the 2007 Pacific Festival of the Book in Victoria, BC. 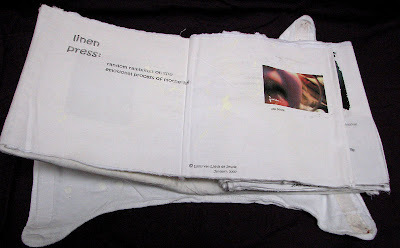 It is an accordion-fold book made of used children's bed linens, wrapped in a cloth diaper. 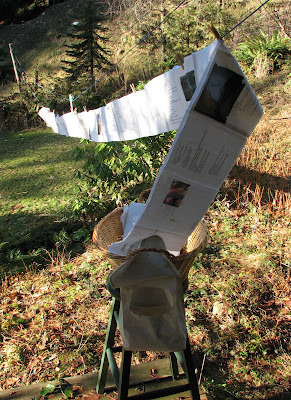 On its pages are poems and other random mothering thoughts, as well as photos from a "mother's eye view". 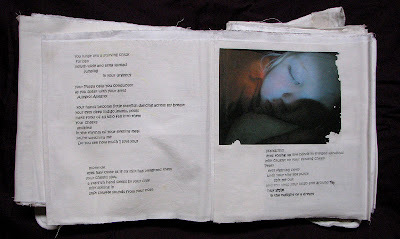 The book in its entirety is my own work. What is the MAMA project? MAMA is a traveling art project that empowers mothers by inspiring and facilitating expression and dialogue about motherhood. The MAMA Project is endorsed by the National Committee of UN Women Canada. For tour dates & other information please see the website: MAMA Project. This blog is a journal of the project's development. Please email to request an installation or performance. What is the significance of motherhood? Nothing less than the palm of the hand that holds our future. In our roles as nurturers of the next generation, we have an enormous impact on the future of human life, so it is our great privilege to do this work consciously, with support, passion, and compassion.